Posted On: 27th November 2018 . High temperature commercial dishwashers use hot water that has reached a high enough temperature to remove food remnants and bacteria. The correct commercial dishwasher temperatures mean that table and cookware is sanitised by hot water. Kitchen staff spend much of their time documenting food storage and cooking temperatures as part of their HACCP plan. 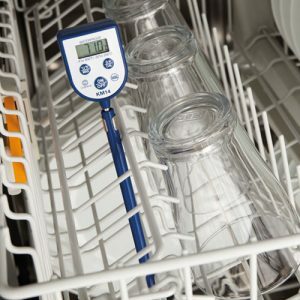 Measuring water temperatures of your dishwasher cycles is just as important to prove to environmental health officers that the correct safe-guards are in place. In a 2011 germ study conducted by the US based National Sanitation Federation (NSF), it was found that the place in most homes with the highest number of germs wasn’t the bathroom, but the kitchen! Washing hands, proper cleaning, sanitising of kitchen work surfaces and following food handling guidelines, are important ways to protect against food-borne illness. A vital measure is to ensure that dishes and cookware, used to prepare and serve food, are properly cleaned and sanitised between each use. High temperature commercial dishwashers are one answer. The wash water of these high temperature commercial dishwashers should be between 65–71°C to achieve proper sanitisation. In the UK, the British Standards Institute (BSI) sets the standards for commercial dishwashers and publishes several standards relating to commercial dishwashers and their operation. With operational guidelines in mind, many environmental health departments require that you cross-check commercial dishwasher temperatures daily and record it. You need to know that your dishwasher cycles are operating at the correct temperature. The question is, how? One method is to use a waterproof digital thermometer. These thermometers have a temperature hold feature that records the highest temperature achieved during the wash/rinse cycle. The KM14 Dishwasher Thermometer incorporates a stainless-steel penetration probe and can be placed inside a commercial dishwasher to check cycle temperatures. 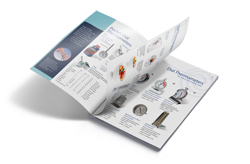 It was designed to measure commercial dishwasher temperatures, so it is completely waterproof and has a ‘Max Hold’ feature that allows you to verify the highest temperature recorded during the dishwasher cycle. Fun fact: The modern dishwasher was invented by Josephine Cochrane in 1886. Cochrane was a wealthy socialite whose servants kept chipping her fine china while hand washing it. She developed a rack and water jet system that debuted at the 1893 Chicago World Fair.